The type of surfboard you ride can make a huge difference to your surfing, both in terms of day to day enjoyment and also with respect to how quickly you progress. Therefore, it's crucial to get the right fit between you and your board. These days there are many different surfboards to choose from. As a result, surfers who do not have an ongoing relationship with a competent shaper, may have difficulty deciding what type of surfboard would best suit them. In addition, different manufacturers, magazine articles and forums make different promises and claims about various types of boards. Some of these promises and claims are untrue or misleading, or at best are distortions of the truth. In these circumstances it's natural that surfers often feel confused or uncertain. For example recently, so called volume calculators have emerged on various websites. These calculators purport to accurately assess how much volume you need in your new board. However in truth, these devices are entirely lacking in empirical foundation and scientific validity and are simply another form of marketing. In reality, there is no substitute for a detailed consultation with an experienced shaper. At Miller Surfboards, whether you are a raw beginner or a highly experienced surfer, your situation will be treated as unique. 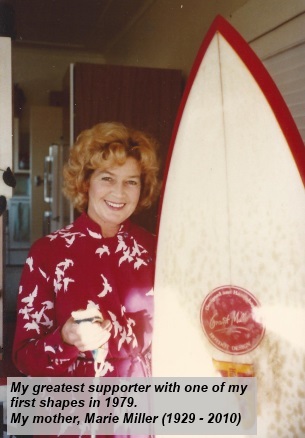 You will receive equal time and attention from Grant, who will personally work with you to design a board which meets your needs now.......and also those needs which will naturally emerge as your surfing progresses. From the moment you start talking with Grant, you will realize that you are not talking with an ordinary surfboard shaper. Rather, you are in direct contact with a professional who knows surfboards inside and out, who cares about his craft, and who is totally focussed on your situation. Our level of personal service and attention to detail is in the superior category. Approximately 8-10 weeks after you receive your new board, Grant will contact you personally to see how the board is performing. After that, he remains available for you to consult with, or to advise you on any surfing related issue, should the need arise. The nature and quality of this relationship is very similar to that experienced by professional surfers with their respective shapers. What inevitably occurs through this process, is a progressive enhancement of your surfing experience. If you require the finest in surfboards, not the cheapest, then you have come to the right place. Grant Miller has been designing and shaping surfboards, both here and internationally, for the past 34 years and has shaped in excess of 22,000 boards. 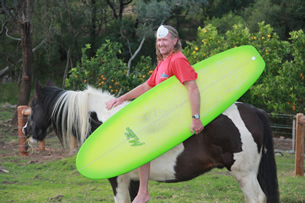 Surfboards can be ordered in person from Grant by prior arrangement, at Little Forest, or at Mona Vale on Sydney's Northern Beaches. Simply call him on - 0410 770 374 to arrange a time. Alternatively, boards can be ordered over the telephone by calling - 0410 770 374 , or by making an enquiry through the website contact page. Finished boards can be picked up in person at Little Forest, freighted with TNT or hand delivered (see FAQ for details). We will happily trade in your used Miller board on a new custom surfboard. We supply Ocean and Earth products at competitive prices and can provide leashes, grips, boardbags and 10mm multi travel bags on request. Simply ask Grant at time of ordering or call him for an obligation free quote. Ocean and Earth are manufacturers of high quality surfing accessories. They are a 100% Australian owned and operated company based at Sussex Inlet on the New South Wales South Coast.
" Although dealing with a shaper might seem like you are purchasing a board, to a large extent you are really purchasing a service. Grant's level of service was exceptional - kept me up to date during a difficult time for him*, returned calls very quickly, delivered when promised and delivered a board that was exactly as promised. He was extremely easy to talk to and genuinely interested in what I wanted and how to make the best board for me, rather than what was easiest for him. Little things, like extra glassing round the fins and tail, are very well thought out and add to the quality of the final product. The custom spray was a bit of an extravagance but was done perfectly - not only does Grant provide a great service but he surrounds himself with quality assistants. This was my first custom board, but I see no reason to ever again buy off the rack, well at least while Grant is still around. ~ Chris Age 43. " * Note from Grant Miller. Chris ordered his board from my bedside at Milton Hospital in early November 2012, a few days after my admission with a very serious spinal injury. Grant Miller, Ujung Bocur July 16th 2012 -- Excerpt from diary : “woke early, surf big. Triple to 5 times overhead. Only a few guys out but not many taking off. Paddled the 7'6” off the corner and out with dry hair and straight into a real big one on the outside. Dropping down the face felt like ages with a huge roar behind me, full power off the bottom and up high flying free. Fade back and then out over the top screaming. 3 hour session, no falls, a career high point at 54”. Work continues on my property at Boyne Ridge. The large retaining wall is now finally finished and a 230 square meter driveway poured between the house and the wall. Rainwater is now directed away from the house and into substantial underground drainage which empties into the dam about 70 meters away. A few days ago we had some really torrential rain, the first real test of my carefully thought out design. I went outside in my Goretex to see how it all flowed. I had worked very closely with my concretor to ensure that the slab had appropriate falls and contours. A lot of time and money went into the whole thing and I was dying to check the water flow. It was fantastic. Whereas previously the groundwater flowed towards the house and then sometimes under it, now it was all away from the foundation, over to the retaining wall and then down the 450cm drain and away. Total success. This has been a major issue with the house ever since it was built 30 years ago. Now its re mediated permanently. I was so stoked. Excited about concrete shaping like never before. My carpenter has installed a new hardwood floor throughout half the house which looks very sweet and the rest will be carpeted. Other projects outstanding are another much smaller retaining wall above the main wall and a bit more driveway. Also a pergola around half the house overhanging the timber deck and a few other bits and pieces. I have also arranged my US trip. Flying to LA on 19th August for 3 months. After getting my old VW Kombi out of storage in San Diego I'll drive up the west coast to Northern Oregon surfing and visiting friends along the way. This is an excellent time of year for surf on the west coast. After returning south, I'll fly to mainland Mexico for a few weeks and stay at Pascuales. There you can be accommodated right on the beach in front of the break. This all means that I'll plan to return to work in late November which is a year off from shaping. Over the last few months I've received many requests for new boards. However with what I've had on my plate here at the house there is no way I could have shaped as well. To shape I need peace of mind and to be free of distractions. Those of you who have built houses or done major renovations would be aware that this is not possible. During the recent state election I handed out how to vote leaflets for the Greens on three occasions. I spent almost 10 hours volunteering at the Ulladulla civic center and so had a fair opportunity to observe the various comings and goings as local people voted. Putting aside some of the abuse I attracted as a Greens supporter, it was a really interesting experience. Invariably the abuse came from white trash clutching Liberal literature. I don't agree with compulsory voting for a number of reasons. I also believe that some people don't deserve to vote. Yes that's right, some people just don't deserve to vote and shouldn't be allowed to. Not because of their abuse to volunteers, but because they are so poorly informed and often just don't care. They are clearly only voting to avoid being fined. Naturally I was really disappointed with the outcome. I'm talking about Labor failing when I say this, as the Greens were never in serious contention. I helped the Greens because some of my friends are Greens members, and I agree with many of their positions, on euthanasia for instance. And because it was the Federal Greens and Labor who forced the Libs to hold a royal commission into the banking industry. In many ways the Greens and Labor are the social conscience of the parliament at both state and Federal levels. As I say, it was a very disappointing result. People have short memories. All the whinging in the electorate about power prices and then they vote in the very party who privatized the electricity grid! Short memories or just plain stupid I'm not sure. I was also disappointed in the Labor campaign. They should have really made some mileage out of this privatization but they didn't. There was also the matter of CSG drilling applications that they failed to pursue. Yes, the stadiums are a massive waste of money, but that was only one issue. The old saying that people get the result they deserve really holds true here. Federal politics. What an arrogant liar Morrison is. Grandstanding on TV last night about "All you'll hear from the Labor party are lies." Morrison's lies are a matter of public record. Telling us for two years as treasurer that there was no need for a royal commission into the banking industry, that it was all a beat up by Labor and the Greens. No reasonably intelligent person can now accept that position. Now he has the gall to ask us to trust him. What a completely disreputable person he is. Delaying calling the election so that he can try and sell their miserable budget to a generally disbelieving electorate. With public money, our money. And we are supposed to believe that he acts in the public interest. In our interest. I'll be volunteering for Labor in the Federal election. For two years I've been agitating through discussions and local letter writing to remove our hopeless Federal member for Gilmore, Ann Sudmalis. Now she's not contesting the next election, citing a "local vendetta" against her. Good riddance to her. I think we have a decent chance in Gilmore with Fiona Phillips and Labor and will be working towards that end. Bring on the election.